Best of Houzz 2018 - Western Living Designer of the Year 2018 Finalist- VIEW PROJECTS ON INSTAGRAM @melissaennisdesign Melissa fuses her passion and eye for design with your style needs to create beautiful spaces that truly reflect your personality and lifestyle. Designing your dream space can be overwhelming! Turn your IDEABOOKS INTO REALITY. Email info@melissaennisdesign.com to set up a design meeting to explain your vision! At Dragon Seed Interior Design we believe in effortless elegance. To ensure a finished product to match, we work with a team of highly skilled contractors and over 25 suppliers of quality furnishings, window coverings, art and decor. We have been satisfying customers with stress-free design experiences since 1990. Why not let us help you with your next project? We would be delighted to serve you. Lori Elms Design Group is dedicated to creating exceptional, distinctive and uniquely personal interiors. Sovereign Style Interiors wants you to love & enjoy your home with their elegant & charming design and interior decorating concepts. Focused on proficiency, creativity & fun, Sovereign Style Interiors aspires to design that special space you’ve always dreamed of. Browse the many services that they proudly offer to get your new project underway. Specializing in residential design, We are passionate about all aspects of interior design, architecture, and construction. We believe that a strong innovative designer creates a harmonious space based on clients’ needs and wishes. Distinct Interiors is an Edmonton-based full-service luxury interior design firm for everyday busy clients. Working with both modern and traditional aesthetics, our objective is to collaborate with our clients to learn about their needs and style to create their dream look. Distinct interiors that are an elegant and unique reflection of each client’s personality and taste. Working with our clients to reach their goals and objectives, Distinct Interiors will plan, design and execute any project whether it is a total home makeover, kitchen renovation, or a simple living room furnishing and decorating. We are dedicated to bringing an imaginative and innovative approach to every design challenge we undertake to enhance each interior space into one that is distinct, functional and tailored to each client’s needs and style. Shantam Interiors lead designer Etienne Grossi travelled and lived around the world, and has been fortunate to work with some exceptional people, helping them transform interiors into spaces of timeless beauty. An artist by trade, he fully invests himself in all his design projects. No matter the aesthetic, his underlying goal is to create spaces that change lives, invite harmony, and inspire. He has a keen appreciation for quality and eclectic tastes, both of which guide every design from start to finish. Tailored Interior is an experienced design studio firm offering a wide range of services in home decor, home staging, and interior design services. Our mission is to focus on each client's needs while incorporating design elements and principles to achieve the perfect ambiance for each space. Complete Home Renovations for a 6,000 sq. ft. $200,000. Real Estate Office Renovations $130,000. Full Design Service for Luxury Estate start at $85,000 Custom and luxury quality art and furniture pieces selected throughout home. Full Basement Renovations $70,000. Products and Design Services for Home Builders $60,000. Kitchen Renovations $50,000. Bathroom Renovation $20,000 Full Design and Decorating Service per room $7,000 to $20,000. Commercial and Residential staging $1500 +up. At Tailored Interior, we believe good design has a great impact on our wellbeing and lifestyle as we are a product of our surroundings. Every space, whether residential or commercial, is unique and should be designed and exhibited in a way to look like a work of art through an enhancement of the space’s features and a minimization of those that are less desirable. We are known for two important things: our dedication to our craft and our creative approach to the design process. Interior design can be stressful for the client and we do our best to make it as easy as possible. We listen to your needs, ideas, and input to keep you informed and involved. Most importantly, we make it exciting and enjoyable for you. We listen, we create, you enjoy. Let our team create your dream space. “The value’s there long after the guilt is gone.” KARLA BILLEY DESIGN INC. is committed to design excellence by working with clients at every stage of the project from start to finish. Working with you to select the appropriate materials and finishes for your budget and scale of project. Trust us to customize your personal living space to fit your needs and lifestyle. Whatever the clients’ style and taste, we can create contemporary, traditional, transitional living environments to suit individual needs. For over 18 years, Karla Billey has been working with clients to create homes to reflect their personal style. 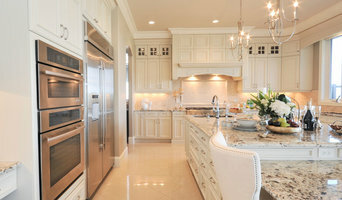 Karla Billey Design Inc. specializes in Custom Interior Design. Trained and versed in all design styles, from contemporary to traditional and every style in between, catering to all your design needs. Customer service and Client satisfaction have built Karla Billey Design Inc. into a go to interior design firm. **BEST OF HOUZZ AWARD 2016-2019** WISE HOME + DESIGN believes that interior spaces should be a narrative of your character and lifestyle. We design spaces that are handsomely curated to your tastes and needs, ensuring your space blends both form and function with style tailored to you. 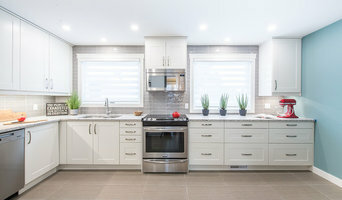 Both Edmonton, AB interior professionals are closely related and often mistaken for the same thing, however, there are some significant differences you should be aware of before hiring. An interior designer, also known as an interiors architect, will not only hone your style down to its very essence but will be able to choose a functional layout. All Edmonton, AB interiors designers require specific schooling and formal training. They use their specialised knowledge of interior architecture, building regulations, materials, and furnishings to help you arrive at your dream home design. Interior design companies can come on board during the early stages of construction to plan spaces and room functions down to the last detail, and can help design and renovate interiors and decorate. On the other hand, an interior decorator will typically be involved with the “look and feel” of a space, and won’t be able to assist in renovations that require structural work. Interior decorators in Edmonton, AB normally come on board after all structural work is complete. Why should I hire an interior designer or decorator in Edmonton, AB? Everybody wants to a home that reflects their personality, though some of us are just too preoccupied with a career and/or family to think about colour schemes, wallpaper, flooring, and lighting. A Edmonton, AB professional interior designer can save you bags of time, stress and months. Residential interior designers and decorators in Edmonton, AB understand the latest trends, have a good sense of layout and functionality. They can also save you money by sourcing products via trade contacts or offer affordable alternatives to blowout iconic designs. How do I choose the right interior designer in Edmonton, AB for my home? Every Indian home is unique in its style and can be an inspiration to define your own style. You start by looking at images and work of different interior designers and decorators in Edmonton, AB. Save the pictures and details of the professionals who match your taste.There are plenty of interior design companies and interior designers who can help you turn your living room into mix-and-match lounge oozing an eclectic style, or turn a pale and interesting minimalist bedroom with shots of colour, or a beautiful space inspired by Scandinavian design. Pick an interior designer in Edmonton, AB who has completed work similar to the look and feel that you desire. Be sure to discuss your needs, ideas, constraints, and budget early on. Some interior companies are design only, while others can oversee the whole project. If it is the latter that you seek, make sure all subcontractors used are well experienced and accredited. What are some of the important questions to ask Edmonton, AB interior designers or interior decorators? Find an interior designer or home decorator on Houzz. 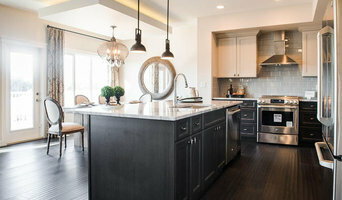 Narrow your search in the Find Pros section to find Edmonton, AB interior designers & decorators. You can also look through photos to find a room you like, then contact the interior design firm who designed it.